Elephant Park near the Ayung River. Bali Activity Elephant Camp is sponsored by Ayunriba Rafting Inc., located in the chanangsari village, west of the Ayung River. Here 18 elephants came from the Sumatra island. 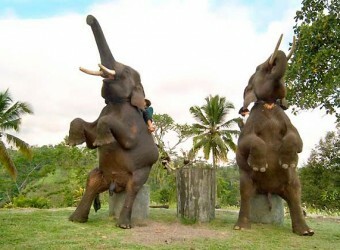 Elephant Ride is Available in 30-minute ride to stroll on site, than 60-minute ride to visit the houses of Bali jungle. We also can met lot of monkeys that live in surrounding of the forest. Available for 1 person guest depending on booking condition. Please contact us. Activity Combination from Ayung River Rafting! Packages are also recommended! Please see activity pages for details. ※Please contact us for detailed pick up time. How many elephant is there? There are 18 elephants live in the park. There is child elephant too. What kind scene can i see? What time star elephant ride? Can i ride an elephant by myselft? Can children ride elephant by themself? Can 1 perosn guest apply this activity? Depending on booking condition, please contact us. This activity is suitable for people between the ages of 2 and 65 and for people in good physical condition. Photos at Elephant ride are available US＄10/photo. Not only enjoyed elephant ride but it was also served coconut juice! Lucky! I was just thirsty. I’ve ever drunk coconut juice once in Japan, but the best if we drink it in Bali.